..... Click the link for more information. ), the hardest natural substance known, used as a gem and in industry. ..... Click the link for more information. varieties there are bort, which is poorly crystallized or of inferior color and in fragmentary condition, and carbonado (black diamond), which is gray to black and opaque, with poor cleavage. Bort and carbonado are used as abrasives, in the cutting of diamonds, and for the cutting heads of rock drills. Diamond abrasives may have been used as early as 2500 B.C. in China. , hydrous silicate of magnesium. It occurs in crystalline form only as a pseudomorph having the form of some other mineral and is generally found in the form of chrysotile (silky fibers) and antigorite and lizardite (which are both tabular). ..... Click the link for more information. . At the surface the blue ground is weathered to a clay called yellow ground. Diamantiferous (or diamondiferous), or diamond-yielding, earth is mined both by the open-pit method and by underground mining. After being removed to the surface, it is crushed and then concentrated. Sorting is done by passing the concentrated material in a stream of water over greased tables. The diamond, being largely water repellent, sticks to the grease, but the other minerals retain a film of water, which prevents them from adhering to the grease. The diamonds are then removed from the grease, cleaned, and graded for sale. The earliest sources of gem diamonds were India and Borneo, where they were found in river alluvium. All famous diamonds of antiquity were Indian diamonds, including the Great Mogul, the Orlov, the Koh-i-noor, and the Regent or Pitt. Other famous diamonds are the Hope (blue), Dresden (green), and Tiffany (yellow). In the early 18th cent., deposits similar to those in India were found in Brazil, mainly of carbonados, though they may have been known as early as 1670. In 1867, a stone found in South Africa was recognized as a diamond. Within a few years, this began a wild search for diamonds, both in river diggings and inland. In 1870–71, dry diggings, including most of the celebrated mines, were discovered. Well-known South African diamond mines are the Dutoitspan, Bultfontein, De Beers, Kimberley, Jagersfontein, and Premier. Russia, Botswana, Congo (Kinshasa), Australia, and South Africa are now the world's major diamond-producing nations; other important countries include Canada, Angola, Namibia, Ghana, and Brazil. The use of diamonds to finance African rebel groups and fuel civil strife led, in 2001 and 2002, to international agreements (the Kimberley Process) designed to certify legitimately mined diamonds, but in 2011 the permitted sale of diamonds from Zimbabwe, where the army has been accused of brutality and human rights violations in diamond mines and diamond revenues support an autocratic government, led to criticism of the certification process. Synthetic diamonds were successfully produced in the early 1950s; a number of small crystals were manufactured when pure graphite mixed with a catalyst was subjected to pressure of about 1 million lb per sq in. and temperature of the order of 5,000°F; (3,000°C;). Synthetic diamonds are now also commercially produced at a lower pressure in a process that heats methane and hydrogen gas into a plasma in a vacuum chamber; the diamond is built up in layers from a substrate through the deposition of vaporized carbon from the methane. Microscopic diamonds also have been produced through other means, including the detonation of explosives containing carbon. Synthetic diamonds are now extensively used in industry, and are also used as gemstones in jewelry. The son of a Hertfordshire clergyman, he first went to South Africa in 1870, joining his oldest brother, Herbert, on a cotton plantation in Natal. , 1852–97, South African financier, b. London. His name originally was Barney Isaacs; he first called himself Barney Barnato when he performed as a comedian. ..... Click the link for more information. . Rhodes brought about the merging of their interests in the De Beers Consolidated Mines, Ltd., which established (1889) an effective monopoly over the diamond industry. Loss of diamonds by theft was reduced through the passage of the so-called I.D.B. (Illicit Diamond Buying) Act, which limited the trade to licensed buyers and imposed penalties for the possession of uncut stones without a license. Thefts were further curtailed by the institution of compounds in which the workers live while employed by the company and which they leave only after being thoroughly searched. Most of the major diamond producers belong to, or have cooperated with, the De Beers–led marketing cartel, formed to maintain the price of diamonds at a high level. De Beers, under Harry Oppenheimer's leadership (1957–84), maintained its dominant position in the industry by using its numerous worldwide companies to buy up new sources of diamonds and to control distribution of industrial diamonds and production of synthetic ones. In the last decades of the 20th cent., however, De Beers' hold over the unpolished diamond market decreased, and in 2000 the company announced it would end to its policy of controlling diamond prices through hoarding and shift its focus to increasing sales. See V. Argenzio, Diamonds Eternal (1974); A. N. Wilson, Diamonds: From Birth to Eternity (1982); R. Newman, Diamonds: Fascinating Facts (1990); S. Kanfer, The Last Empire (1993). a mineral, a crystalline modification of pure carbon (C). The diamond possesses the greatest hardness of any material known in nature, which explains its use in many important branches of industry. Three crystalline modifications of carbon are known: the cubic variety, or diamond, and two hexagonal varieties, graphite and black carbon. The latter is found in meteorites and is produced artificially. Natural diamond Diamonds crystallize in the cubic system. The most important crystallographic forms of diamonds are flat-edged (octahedron, rhombic dodecahedron, cube, and various combinations of these) and curve-edged (dodecahedroids, octahedroids, and cuboids). Complicated compound forms are found: twins interpenetrating according to spinel law, penetration twins, and granular aggregates. The faces of the crystals are usually covered by growth and solution figures in the form of individual projections and depressions. Varieties of diamonds include bailas (spherulites of spherical shape and radial-fibrous structure), carbonado (crypto-crystalline and microcrystalline aggregates of irregular shape, dense or slaglike), and bort or bortz (fine-grained and coarse-grained polycrystalline formations of irregular shape). The dimensions of natural diamonds vary from microscopic grains to very coarse crystals hundreds and thousands of carats in mass (1 carat = 0.2 g). The size of mined diamonds is usually 0.1–1.0 kt (carat); coarse crystals larger than 100 kt are rare. The largest diamond in the world, the Cullinan, with a weight of 3,106 kt in the rough, was found in 1905 in South Africa; from it were made 105 brilliants, including the Great Star of Africa (Cullinan I) of 530.2 kt and the Cullinan II of 317.4 kt, which were cut for the British royal scepter and imperial crown. Also found in Africa were the 971.5 kt Excelsior (1893) and the 726 kt Jonker (1934), from which brilliants of various sizes were also cut. Depending on properties—including dimensions, shape, coloration, and number and type of flaws—and on future use, diamonds are divided into seven categories and 23 groups. The first category includes gem diamonds; the second category, bright diamonds for various purposes; third, diamonds for tools using single crystals and for components of measuring instruments (for example, for measuring hardness); and so on. Two types of diamonds—gem diamonds and industrial diamonds—are distinguished on the world market. Gem diamonds include diamonds of perfect shape, high transparency, and freedom from cracks, inclusions, and other flaws. Brilliant-cut diamonds, or diamonds faceted with a special “brilliant” face, are known as brilliants. Gem diamonds are generally used as ornaments and provide a reliable source of capital investment in capitalist countries. Among the industrial diamonds are all other mined diamonds, no matter what their quality or size. Industrial diamonds are also used in powder or dust form and as individual crystals which can be cut or faceted to the necessary shape (cutters, draw plates, and the like). Physical properties The unit cell of the diamond crystal lattice is cube-shaped. The carbon atoms are located at the corners of the cube, at the centers of the cube faces, and at the centers of the four nonadjacent octants (see Figure 1). Each C atom is bound to its four nearest neighbors located symmetrically with respect to the vertices of a tetrahedron by the “stable” chemical bond—the covalent bond. Neighboring atoms are spaced 0.154 nanometers apart. The ideal diamond crystal can be considered as a single giant molecule. The strong bond between the C atoms is responsible for the great hardness of diamonds. Figure 1. The unit cell of the diamond crystal lattice. 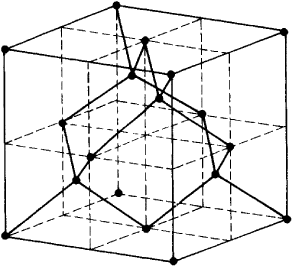 The C atoms are located at the vertices of the cube, at the centers of the cube faces, and at the centers of the four noncontiguous octants. The packing density in the lattice is 34 percent. In the most densely packed crystal lattices, packing densities of 68 percent and 74 percent are attained. There is reason to believe that denser modifications of carbon (possibly metallic) exist at high pressures (see Figure 2). A diamond-like structure is also exhibited by other elements belonging to Group IV of the periodic table: Si, Ge, Sn. However, the strength of the covalent bond decreases with increasing interatomic distance in the sequence C-Si-Ge-Sn. The diamond crystal lattice is also shared by many chemical compounds—for instance, compounds of elements belonging to Groups III and V in the periodic table (the sphalerite-type lattice—ZnS). The structures of these compounds (the semiconductors) appear to have greater strength, because of the additional ionic bond (in addition to the covalent bond), than the structures of elements of Group IV which belong to the same period of the table of elements. For example, the nitrogen-boron compound known as bora-zon is not inferior to the diamond in hardness. Because of the special features of the crystalline structure (all tetravalent electrons firmly bonded to the carbon atoms), the ideal diamond crystal (free of impurities or lattice defects) must be transparent to visible light and consequently a dielectric. In real crystals, however, small amounts of impurities and lattice defects are present in different amounts in different samples. Even in the purest gem diamonds, the impurity content will amount to 1018 atoms per cm3. The most commonly encountered impurities are Si, Al, Ca, and Mg. The impurity distribution in diamonds can be irregular—for instance, more at the periphery than at the center. The strong bond between the C atoms in the diamond structure is responsible for the fact that any imperfection of the diamond crystal lattice exerts a profound effect on the physical properties of the diamond. This is responsible, in particular, for discrepancies in the data reported by different investigators. In a general description of the properties of diamonds, it is assumed that the maximum impurity content is 5 percent, with no single impurity exceeding 2 percent. Diamonds may also have solid inclusions (olivine, pyroxene, garnets, chrome spinellids, graphites, quartz, iron oxides, etc. ), liquid inclusions (water, carbonic acid), and gaseous inclusions (nitrogen, etc.). The density of diamonds in different mineralogical specimens fluctuates between 3,470 and 3,560 kg/m3 (between 3,010 and 3,470 kg/m3 in carbonado). The theoretically calculated density of diamonds (based on X-ray photographs) is ∼ 3,511 kg/m3. The diamond is the standard for hardness on the Molls’ scale, with a value of 10 (corundum—9, quartz —7, calcite—3). The microhardness of diamonds, as measured by the indentation on a diamond pyramid, runs from 60–70 to 150 GN (giganewtons) per square meter (or from [6–7] x 103 to 15 x 103 kgf/mm2), depending on the testing technique (∼104 kgf/mm2 in the Khrushchev and Berkovich method, compared to corundum ∼ 2 ξ 103, quartz ∼ 1.1 x 103, and calcite ∼ 1.1 x 102 kgf/mm2). The hardness of the different crystallographic faces of diamonds is not identical; the octahedral face with the Miller index (111) is actually the hardest. Diamonds are very brittle and exhibit perfect cleavage on the (111) face. The anisot-ropy of the mechanical properties is taken into account when processing single-crystal diamonds and when mounting and orienting them in a single-crystal tool. Young’s modulus, or the modulus of normal elasticity of diamonds, is 1,000 GN/m2 (∼1013 dyne/cm2), and the bulk compression modulus is 600 GN/m2 (∼6 ξ 1012 dyne/cm2). The thermal linear expansion coefficient increases with the temperature from 0.6 x 10-6°C-1 in the interval 53–303°K to 5.7 x 10-6 in the interval 1100–1700°K. The thermal conductivity coefficient decreases with increase in temperature over the range 100–400°K from 6 to 0.8 kilojoules/(m ξ °K) (from ∼ 14 to ∼ 2 calories/[sec x cm ξ °C]). The room-temperature thermal conductivity of diamonds is higher than that of silver, while the molar heat capacity is 5.65 kJ/(°C x kmole). Diamonds are diamagnetic, with a magnetic susceptibility per unit mass of 0.49 x 10–6 cgs units at 18°C. Diamonds differ in color and transparency. Diamonds found in nature can be colorless, white, light blue, green, yellowish, brown, reddish (various hues), or dark gray (all the way to black). The coloration is frequently distributed unevenly. Diamonds change color in response to bombardment by α-particles, photons, neutrons, and deuterons. The refractive index of diamonds is 2.417 (at wavelength λ = 0.5893 μm) and increases with the temperature; the dispersion is 0.063. The angle for total reflection is 24°24’. Some diamond specimens exhibit optical anisotropy—for instance, birefringence arising from internal elastic stresses due to inhomogeneities on the crystal structure. Most diamonds luminesce (in the green and blue regions of the spectrum) when irradiated by ultraviolet light or X ray or bombarded by electrons, α-particles, and neutrons. Neutron irradiation of diamonds, while producing no constant radioactivity, reduces the density of diamonds and “embrittles” the lattice, so that the abrasive qualities of the diamond deteriorate. Most diamonds selectively absorb infrared radiation (λ∼8–10 μm) and ultraviolet (wavelength shorter than 0.3 μm). These diamonds are referred to as type I diamonds. Type II diamonds (discovered in 1933) are much rarer in nature, lack absorption lines in the 8–10 μm region, and are transparent up to ∼ 0.22 μm. Diamonds with characteristics of both types are encountered, as well as diamonds possessing type I criteria in some parts of the crystal and type II criteria in other parts. The principal spectroscopic features of the crystals correlate well with the amount of nitrogen contained in the crystal lattice and apparently with subtle differences in the crystal structure. Figure 2. Regions of existence of carbon in different states (phase diagram): (1) liquid, (2) stable diamond, (3) stable graphite, (4) stable diamond and metastable graphite, (5) stable graphite and metastable diamond, (6) hypothetical region of existence of other solid carbon compounds, (7) points corresponding to experimental conditions for direct transformation of graphite into diamond, (8) region of formation of diamond using metals as catalysts, (9) region of experiments of formation of diamonds at low pressures (Butuzov, USSR). A subdivision of type II diamonds into subtypes IIA and IIB, distinguished by their electrical properties, has been proposed. The electrical resistance of type I diamonds is ρ∼ 1012 – 1014 ohm x m. The resistance of diamonds of type IIA is ρ ∼ 1012 ohm x m; of subtype IIB, it is ρ ∼ 0.5–10 ohm x m. These latter are p-type impurity semiconductors, exhibiting photoconductivity and on heating showing absorption at wavelengths λ greater than 6 μm. Such diamonds are very rare and were discovered only in 1952. Diamond crystals of an exceptionally low resistance ρ ∼ 10 -2 and capable of carrying a high current have been found. Among the non-semiconducting diamonds of the second type, one can find crystals whose electrical conductivity increases markedly on irradiation with α-particles, electrons, and γ-rays. The depth of penetration of α-particles in diamonds is not greater than 10 μm, while the depth of penetration of electrons (of energy ∼ 1 MeV) is 1 mm. These diamonds can be used in crystal counters. The advantages of crystal counters include use at room temperature, long-term continuous duty, and ability to define narrow beams of radiation. They can be sterilized, which is very important in biological research. Diamonds are stable to the action of acids and alkali caustic solutions (even at the boiling point) and dissolve in fired melts of saltpeter (sodium nitrate or potassium nitrate) and sodium carbonate (temperature ∼ 500°C). Diamonds burn in air at 850–1000°C and in oxygen at 720–800°C. Appreciable surface graphitization of diamonds occurs in a vacuum or in an inert-gas atmosphere at 1400°C. This process is accelerated when the temperature is raised, and complete conversion occurs within 15–30 minutes in the region of 2000°C. Diamond crystals are stable when subjected to pulse heating at 3400°C (for several milliseconds) but transform to graphite at 3600°C and higher temperatures. These boundary temperatures for diamonds are indicated on Figure 2 (see boundary between regions 5 and 3). Occurrences and mining Diamonds were known many centuries before the Common Era. Diamonds were first mined in India, on the island of Borneo in the sixth to tenth centuries, and in 1725 in Brazil. The center of diamond mining has shifted since the 1870’s from Asia and South America to Africa: first to South Africa and later to Central, West, and East Africa. Diamonds are recovered from primary occurrences and placer occurrences. Kimberlites, found predominantly on ancient shields and platforms, constitute the only industrially profitable host rock for diamond. Kimberlites are found most frequently as pipe-shaped bodies of different dimensions, dikes, veins, and, more rarely, sills. At depths of several hundred meters beneath the earth’s surface, the pipes can become slender veins and dikes. Pipes as large as 1,525 x 1,068 m are of the greatest industrial interest (these include the Mwadui tube in Tanzania), while dikes and veins are worked less frequently. All of the diamond-bearing platforms can boast of over 1,500 kimberlite bodies, but only a few support a diamond industry: in foreign countries, the Premier, De Beers, Bultfontein, Dutoitspan, Wesselton, Kimberley, Jagersfontein, and Finsch pipes in the Union of South Africa, the Mwadui pipe in Tanzania, the Majgawan pipe in India, dikes and veins in Mali, the Belsbank and Zwartruggen dikes and veins in the Republic of South Africa, the Coïdou dikes and veins in Sierra Leone, the dike on the Bou River in the Ivory Coast, and others. Diamonds are distributed with extreme unevenness in the kimberlites. They are found as isolated crystals and more rarely as growths or aggregates; it is typical that nowhere are coarse accumulations found. Diamond occurrences are now mined with diamond contents around 0.4–0.5 kt/m3, or as low as 0.08–0.10 kt/m3 in some pipes with exceptionally high-grade diamond ore such as Jagersfontein in the Republic of South Africa. The yield from individual pipes is 2–2.5 million carats per year. Some pipes have yielded considerable quantities of diamonds: the Premier, about 55 million carats; the Bultfontein, about 24 million carats; the Wesselton, about 23 million carats. Opinions differ as to the genesis of diamonds in kimberlite. Some investigators surmise diamond crystallizes at great depths within the confines of the earth’s upper mantle, while others hold the view that diamond forms at depths of 2–4 km at intermediate centers appearing on the boundary between the bedrock and the sedimentary mantle of platforms. Most diamonds are mined from placer deposits (80–85 percent) of different origin (deluvial, alluvial, shoreline or sea beach alluvial placer deposits, which are worked at diamond contents of 0.25–0.50 kt/m3). Diamonds were discovered in Russia in 1829 in the Central Urals (in the basin of the Koiva River), and a diamond raw materials base was established in the USSR during the years of Soviet power. The diamond deposits discovered in the Urals are consolidated into the Urals diamondiferous regions located on the western slopes of the Southern, Middle, and Northern Urals, where placer deposits with high-grade diamond ore are located. Diamond deposits were discovered in Eastern Siberia in 1954–55 in the Yakut ASSR. The Siberian diamondiferous region is confined to the Siberian platform; both placer deposits and primary deposits (the latter represented by kimberlite pipes) are known within its confines. The deposits are concentrated in western Yakutia (the Mir pipe, the Udachnaia and Aikhal pipes, and others). Diamonds have also been found in the Timan Mountains, the Ukraine, and Kazakhstan. The worldwide crop of natural diamond (USSR excluded) rose from 7.5 million carats in 1929 to 30 million carats in 1967. About 900 million carats (180 tons) of diamonds have been mined during the entire period that the deposits have been worked (as of Jan. 1, 1968). Around 80 percent of the diamonds mined are used in industry. Prior to the 1930’s, the Union of South Africa (Republic of South Africa since 1961), where gemstones predominate, firmly kept its hold on first place in the world market. Subsequently, with the rising demand for industrial diamonds, the Congo (now Zaïre), with its enormous reserves of such diamonds, has taken first place in the quantity of diamonds mined. The mining and marketing of diamonds in the majority of capitalist countries is controlled by a large monopoly—the Diamond Syndicate. Exploitation Placer deposits of diamonds are worked by open-pit methods, using excavators or draglines. Mining of diamond-bearing rock from pipes was first attempted in open-pit work; underground mining at great depths is a more recent development. Underground mining includes stoping of diamondiferous rocks in chambers and shipping of those rocks to the haulage levels via ore shoots. The mined diamondiferous rock, after preliminary beneficiation (in placer sands, by removing clayey particles and coarse gravel; in kimberlite pipes, by fragmentation and selective grinding), is enriched until a concentrate is attained on jigging machines or in heavy slurries. Extraction of diamonds into a concentrate results in recovery of 96 percent of the diamond content of the ore. The most widespread method for recovery of diamonds from concentrates is the greased-table process, based on the selective ability of diamond to stick to greasy surfaces (suggested by F. Kirsten in 1897). Besides the greased-table process, electrostatic separation is employed for the extraction of fine diamonds (to 4 mm). The separation method is based on the differential conductivity of minerals, the diamond being a poor conductor of electricity. An X-ray luminescent method for extraction of diamonds from concentrates, based on the ability of diamond crystals to luminesce, has been developed in the USSR. Process equipment in which X-ray tubes are replaced by radioisotopes is being developed. X-ray luminescent automatic sorters have been constructed in which, instead of visual spotting and manual collecting of the diamonds from the conveyor belt, an electron multiplier (the so-called electro eye) is used. Synthetic diamonds Diamonds made by artificial means from nondiamond carbon and carboniferous substances have a crystalline structure and the basic chemical composition of naturally occurring diamonds. After the chemical composition of diamonds was determined in the late 18th century, numerous attempts to produce artificial (synthetic) diamonds were made in various countries. Reliable results in the synthesis of diamonds were obtained in the mid-1950’s almost simultaneously in different countries (USA, Sweden, Republic of South Africa). Diamonds were first synthesized in the Soviet Union at the Institute of High-Pressure Physics under the supervision of Academician of the USSR Academy of Sciences L. F. Vere-shchagin. Industrial production of diamonds was developed in collaboration with the Ukrainian Institute of Ultrahard Materials. Successful production of synthetic diamonds in the USSR was announced at the July plenum of the Central Committee of the Communist Party of the Soviet Union in 1960. Diamonds are a crystalline modification of carbon which is stable only under high pressures. 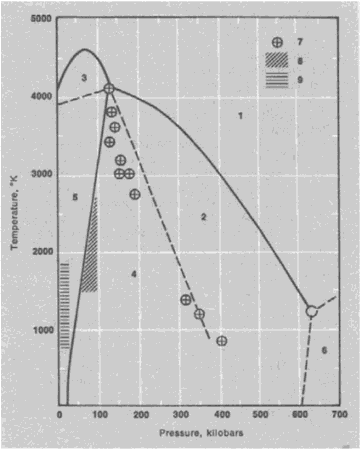 The pressure of thermodynamic equilibrium between diamonds and graphite at absolute zero (0°K = -273.16°C) is roughly 1500 MN/m2 (15 kilobar) and increases with the temperature (see Figure 2, boundary between regions 4 and 5). Graphite is stable at pressures below equilibrium pressure, while diamonds are stable only at higher pressures. However, the mutual transformation of diamonds into graphite and graphite into diamonds at pressures effectively below or above the equilibrium pressure occurs with noticeable velocity only at sufficiently high temperatures. Consequently, the diamond persists in its state for a practically unlimited time (metastable state) under normal pressures and temperatures up to 1000°C. The direct transformation of graphite into diamond requires a high temperature and correspondingly high pressure (region 7 on Figure 2). Diamond synthesis is aided by the use of various agents which contribute to the breakdown or deformation of the graphite crystal lattice or which lower the energy required to restructure that lattice. Such agents can exert a catalytic effect. The process of diamond synthesis is also explained by the dissolution of graphite or by the formation of unstable compounds with carbon; the carbon, upon coming out of solution or appearing upon the decomposition of the compounds, crystallizes out in the form of diamond. Various metals can play the role of such agents (for instance, iron, nickel, and their alloys). The pressures required for diamond synthesis are produced by massive hydraulic presses (bringing to bear several or dozens of meganewtons or hundreds and thousands of tons), or in chambers with a hard compressible medium. A heater unit containing the reaction mixture, consisting of graphite (or some other carbon-containing substance) and a metal which promotes diamond synthesis, is placed in the compressible medium. After the necessary pressure has been generated, the mixture is heated by electric current to the synthesis temperature. This temperature is maintained for a period of several seconds to several hours (usually several minutes are sufficient to form crystals with linear dimensions of tenths of a millimeter). The reaction mixture is cooled to room temperature in order to keep the diamonds under normal conditions (in a metastable state), and then the pressure is released. Substances used in the synthesis or added to the reaction mixture appear in the diamond as impurities; as such they are responsible for some of the properties of the synthetic diamonds (in the first place, electrical and optical properties). For example, boron impurities impart to the diamond crystals a coloration ranging from light blue to dark red; boron and aluminum impart certain temperature dependencies of electrical resistance to the diamond. The shape and coloration of the crystals also depends on the temperature conditions: more perfect transparent octahedral crystals are typical of synthesis at high temperatures. Lowering the temperature produces cuboctahedral and cubic crystals, while black cubic crystals form in the low-temperature range. Microscopic diamond crystals can be obtained even without benefit of catalysts when graphite is compressed by a shock wave. This method has not yet found industrial application. Methods for synthesizing diamonds in the graphite stability region (region 9 in Figure 2) have also been developed. The comparatively rapid growth of synthetic crystals and the presence of specific impurities are responsible for their peculiar physical and mechanical properties. Variation of the synthesis conditions permits the production of crystals of different dimensions (to 4 mm), degrees of perfection, purity, and consequently specified or custom-tailored mechanical and other physical properties. Under certain conditions, microcrystalline aggregates of the bailas type (diameters of several millimeters) and carbonado form, distinguished by high strength and particularly by stability against impact loading. Industrial synthetic diamonds of ordinary strength, enhanced strength, and high strength have been manufactured in the USSR since 1965. They are used as abrasive materials and also in the fabrication of single-crystal tools. With the expanded production of synthetic diamonds, the national economy has been obtaining high-quality abrasive materials cheaper than natural diamonds. It is possible that the development of methods of diamond synthesis will permit production of synthetic diamonds with specific physical properties such as semiconducting properties, opening up a new range of applications of diamonds in instrument design. The annual production of synthetic diamonds in the USA is 7.0 million carats (1967). Shafranovskii, I. l.Almazy. Moscow, 1964. Trofimov, V. S. Osnovnye zakonomernosti razmeshcheniia i obrazovaniia almaznykh mestorozhdenii na drevnikh platformakh i v geosinklinal’nykh oblastiakh. Moscow, 1967. Vereshchagin, L. F. “Fizika vysokikh davlenii i iskusstvennye almazy.” In Oktiabr’ i nauchnyi progress, book 1. Moscow, 1967. Butuzov, V. P. “Metody polucheniia iskusstvennykh almazov.” In Issledovaniia prirodnogo i tekhnicheskogo mineraloobrazovaniia. Moscow, 1966. Kolomeiskaia, M. la. Natural’nye i sinteticheskie almazy v promyshlennosti. Moscow, 1967. Rozhkov, I. S., and A. P. Morov. Almazy na sluzhbe cheloveka. Moscow, 1967. Sobolev, V. S. Geologiia mestorozhdenii almazov Afriki, Avstralii, ostrova Borneo i Severnoi Ameriki. Moscow, 1951. Fersman, A. E. Kristallografiia almaza. Moscow, 1955. Khil’tov, Iu. M. “Glavneishie etapy formirovaniia kimberlitov.” Dokl. AN SSSR, 1958, vol. 123, no. 3. Vasil’ev, V. G., V. V. Koval’skii, and N. V. Cherskii. Problema proiskhozhdeniia almazov. Yakutsk, 1961. Orlov, Iu. L. Morfologiia almaza. Moscow, 1963. Vinogradov, A. P., O. I. Kropotova, and V. I. Ustinov. “Vozmozhnye istochniki ugleroda almazov po izotopnym dannym C12 C13.” Geokhimiia, 1965, no. 6. A colorless mineral composed entirely of carbon crystallized in the isometric system as octahedrons, dodecahedrons, and cubes; the hardest substance known; used as a gem and in cutting tools. One of five pedagogical languages based on Markov algorithms, used in "Nonpareil, a Machine Level Machine Independent Language for the Study of Semantics", B. Higman, ULICS Intl Report No ICSI 170, U London (1968). (cf. Brilliant, Nonpareil, Pearl, Ruby). Diamonds are valuable, timeless, and very precious. Dreaming about diamonds may have several different meanings. It could represent love and money, as well as universal truths and spiritual consciousness. The diamond is an object of desire and symbolizes those things that are most valuable to you. We are all constantly in pursuit of those things that we have not obtained but want and need in order to feel complete. Your dream may help you to decipher what is most valuable and then give you clues where to find it. Office of Naval Research to begin supporting basic CVD diamond research. Finally, the emergence of the diamond production industry in Canada and the corresponding new opportunities for criminals have become the harbinger of new policing challenges. In September, the World Diamond Council, which represents more than 50 mining companies, trade associations, manufacturers and retailers, launched the Web site diamondfacts. Searches in Diamond are implemented using searchlets, which are fragments of binary code along with configuration parameters. In Collapse, Diamond proves himself an enthusiastic apostle of Malthusianism. 7-billion-year-old rocks, the oldest known diamond deposits in the world. For instance, diamond is a semiconductor--the same type of material as silicon, upon which modern electronics is based. At the bottom rung of the international diamond trade, the need to scrape up enough money to eat sends Africans like Mati Balemo clawing through the mud of a Congolese streambed. The high temperature and pressure 160 kilometers (100 miles) below Earth's surface are perfect for diamond formation. As the president of the Upper East Side Community Board 8, Diamond became familiar with planning and zoning issues and ran for both City Council and Assembly, but lost both races. For the past three years, Blue Diamond has aired in the United States a series of award-winning, home-spun television commercials featuring real farmers waist deep in almonds, politely asking viewers to buy "A can a week, that's all we ask.